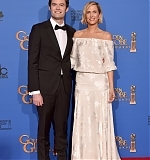 As mentioned before, Kristen Wiig attended the 72nd Annual Golden Globe Awards on Sunday She presented the award for Best Movie Screenplay alongside The Skeleton Twins and SNL co-star Bill Hader. They named some of the most classic movie-lines (though, really not) in their hilarious segment, and Kristen looked beautiful in a Delphine Manivet dress. Pictures have been added to our photo gallery, and the hilarious clip to the video archive!